Social media is at once powerful and dangerous. It’s powerful because of the opportunity it presents to connect with your target audience in a timely, authentic, and useful way. But it’s dangerous because of the resources that can be wasted with actions that don’t follow a coherent strategy — especially if those actions persist with no checkpoints to assess what’s working, what’s not, and what the smartest next step should be. The key is to find a balanced social media strategy that fits your goals and your situation. “We have to find that smart middle ground. But there are so many social media tools out there. For every action you might consider doing, it feels like there are dozens of options for tools to help you do it, all with their subtle differences. So where are you supposed to start? We created this page to give you our recommendations for social media tools that will help you find that smart middle ground Sonia was talking about — so you can execute your social media strategy in a way that delivers results that you can both feel and measure. And this is something we know a thing or two about, because we’ve been using social media to grow our audience and build several successful businesses since 2006. Yes, the words we’ve published here on our blog have been our most important content asset, but we’ve needed the power of social media to help us drive targeted traffic to them. We want this page to be a guide that helps you do the same. Disclosure: We are committed to researching, testing, and recommending only the best social media tools, based on our direct experience as pioneers in the industry. Copyblogger may receive commissions from purchases made after visiting links within this Buyer’s Guide, at no additional cost to you. Our recommendations are made without regard for whether a commission is offered, or for the amount of commission. If you’re going to invest money into a social media campaign, then you should also be prepared to invest some time and energy into actually engaging in the discussions that are relevant to your audience, your content, and your products. And while your first thought when it comes to “engagement” is probably about sending and responding to messages, don’t underestimate the power of just listening. Think about offline conversations. What makes for an engaging conversationalist? It’s not just someone who is constantly talking, but someone who listens as much as, if not more than, they talk. How else will you know what is actually useful and relevant to say? Some people might actually tell you that “listening to your audience” is actually the top bullet in the list of elements that comprise a smart social media strategy. Those people are worth listening to. It’s important to note that the tools in this section are not strictly for engagement. They also provide features that help with scheduling and analyzing. But if engagement is your primary focus when selecting a social media tool, then these are the three to start with. Agorapulse positions its social media tool as “the easiest and most affordable social media management tool for teams and agencies” and highlights five key feature categories: publishing, engaging, listening, reporting, and collaborating. The “Small” plan is slightly more expensive than HootSuite’s smallest plan, but delivers a more full-featured experience. Agorapulse also has the highest customer rating (4.5 stars) at G2 Crowd of the three options listed here. Sprout Social wants to help you build deep connections with customers and prospects at whatever scale you need. They have enterprise plans, as well as an agency program to help you use Sprout Social as a tool in a digital marketing agency business. Hootsuite has attractive offerings for both individual professionals as well as teams and organizations. Unlike Agorapulse and Sprout Social, Hootsuite offers a free plan. It’s limited, but does allow you to try it out and get comfortable before making a bigger commitment. Try a free Hootsuite plan today. If you are an active personal user of the social media platform that you want to use for your brand or business, then you may not need an expensive tool to help you engage — because you’re in there engaging already! But having an efficient and user-friendly social scheduling tool at your fingertips is always helpful. Not only does a smart scheduling tool free you up to spend more time engaging on your social platform (and yes, this helps), some tools even help you load and save evergreen messages that can be posted in the future. This is a great way to draw attention to content that will still be relevant well into the future. Edgar was originally designed to make social media scheduling smarter and more streamlined. And it does so by giving you an unlimited content library plus a “smart” content composer and even auto-expiring content for seasonal or one-time promotions. Plus, pricing is simple. There’s just one. Try Edgar for 30 days risk-free today. Buffer is one of the original social scheduling tools, and it still does social scheduling very well. While it doesn’t offer some of the bells and whistles that Edgar does, the browser extension and customer support really set Buffer apart. Plus, with Buffer’s Reply and Analyze extensions, you can turn it into a powerful all-in-one tool. Try Buffer Publish for free today. CoSchedule’s social scheduling tool is fantastic, including a template feature for scheduling similar types of posts that makes the process as simple and intuitive as it’s ever been. But CoSchedule can also do a lot more than that, potentially revolutionizing the way you manage your content calendar. Try CoSchedule for 30 days risk-free today. You can benefit from social media without ever publishing a word by listening to the people you’re serving and staying abreast of important news and developments. But as soon as you decide to join the discussion, especially if you have loads of people paying attention to your content and taking action on it, then design becomes an important consideration for you. The social media landscape is simply too noisy and crowded for most people to compete with words and ideas alone. The way those words and ideas are packaged makes a difference. Sometimes, it can make all the difference. A design tool delivers a large chunk of its value by saving you time with useful templates, and by providing an intuitive user interface that makes your time spent designing pleasant and productive. Canva does both, and can serve as the only design tool you need for all of the social media platforms you spend time on. Get started with Canva for free today. Social media design doesn’t have to be complicated. Whether it be creating an attention-grabbing Instagram post or a featured image for a blog post, sometimes you just want to be able to overlay text on an image in a way that is easy to read and elegant. Word Swag helps you do that, all for free. 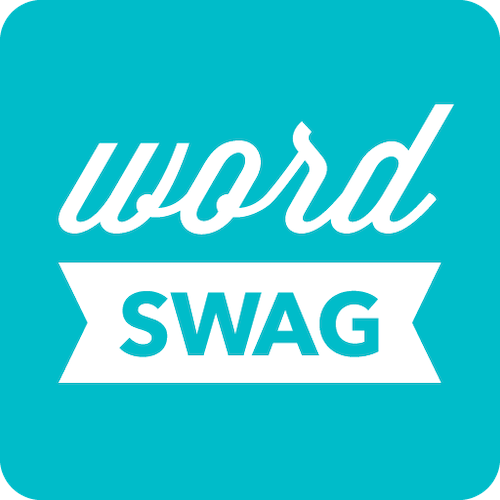 Try Word Swag for free today. Crello’s tagline is “graphic design made easy.” They should add: and free. If you want a solution that gives you access to a bunch of professional templates, and that was built for “marketers, social media specialists, entrepreneurs, bloggers, and anyone who needs a simple solution for their creative projects,” then Crello is worth checking out. Try Crello for free today. How do you know if the time you’re investing in social media is actually giving you a return? Because if it’s not, your time is too valuable to waste. The truth is that you can never know for sure. How do you truly quantify the value of people having positive interactions with you and your brand, or the value of what you learn by listening? You can make educated guesses, but you’ll never know for certain. Still, there is a lot about the time you spend on social media that you can know. And it’s worth knowing. Which is why you should consider a tool that gives you rich, timely analytics information that will help you make better decisions about where to invest your time and what you should be doing. BuzzSumo delivers two specific types of information that are extremely valuable: the knowledge of what content performs best for any topic or competitor, and who key influencers are in your niche that are worth targeting to promote your content. It’s not cheap, but if you’re committed to social media success, then BuzzSumo can help you ensure you’re getting value in return for your time and effort. Get started with BuzzSumo today. Do you want a dashboard for monitoring … everything? Then Cyfe might be the tool you need. It uses real-time data to track how you (or your clients) are doing across a host of social media channels to help you measure the ROI of your social efforts. You can also track sales, project management, and more, making it convenient and allowing you to have a less-siloed focus on social media.